Hannah wants a son, and prays to God without a mediator. She gets a son! You can sing some non-Mary-specific Magnificats for this one. Tune In / Online Resource Father of earth, Mother of sea (Dave Brown) A latinesque song about the Spirit being with those who are victims, prisoners and the sick, as well as present in our prayers. Note particularly the phrase “Spirit who prays with us while war goes on… pray with us Lord”. Sound sample, lyrics and downloadable songbook. TiS 560 / AHB 465 / NCH408 / CH192 / UMH132 / VU654/655 / WoV782 / ELW757 / A&M584 / CP529 / CP(E) 368 / Cha088 / Srce2-15 / 82Hml-665 / Lau959 / StF455 / MP016 All my hope on God is founded / is firmly grounded (Joachim Neander) Most translations of this well known German hymn are not inclusive, but the "firmly grounded" translation by Fred Pratt Green in NCH and WoV are, so if you have those books (BUC people, we have NCH, and I have WoV). Older version of the lyrics. Oldy-but-a-goody. *G(II)128 / GC147 / GC(II)83 / G(3)102 / PfAS1020 / URW020 And Holy Is Your Name (David Haas) Lovely words to a simple Celtic tune (WILD MOUNTAIN THYME). Sound sample and lyrics. Tune. Taizé / GC(II)530 / Lau689 Let Us Sing to the Lord / Benissez le Seigneur (Jacques Berthier) A joyous chant, with an optional cantor part. Sound samples, sheet music and translations. Good for kids. Taizé / Iona (T1AU) / StS012 / GC(II)522 / G(3)630 / PfAS1018 Magnificat (Jacques Berthier) “Magnificat amina mea dominum” To be honest, I think it’s kind of funny to sing “Magnificat” as a lyric, but maybe that's just me. There are also alternative English lyrics (Sing out my soul), which are good if your congregation thinks singing in Latin is quirky. A catchy and happy Taize chant. Sheet music, sound samples, and English translation. *Online resource Magnificat (Bruce Harding) A fun magnificat, using the Latin phrase “Magnificat amina mea deum”. I think our musicians would like this one! Sound and sheet music sample. GC788 / G(II)568 / GC(II)773 / G(3)892 All that I am sings (David Haas) Nice. Simple refrain. Lead sheet and lyrics. Sound sample. SFFS 2005 Arise Shine for your light has come (Gary Smith) A simple call and response. Good for an intro to worship. Normally used at Epiphany, but it could work here too. *Taizé / AoV2-005 / A&M840 / GC(II)510 / SP327 / URW386 / StF360 Jesus Your Light / Jesus le Christ (Jacques Berthier) “Jesus your light is shining within us, let not my doubts and my darkness speak to me; Jesus your light is shining within us, let my heart always welcome your love”. One of the slightly more upbeat Taize chants. Sheet music, samples and translations. Good for kids. 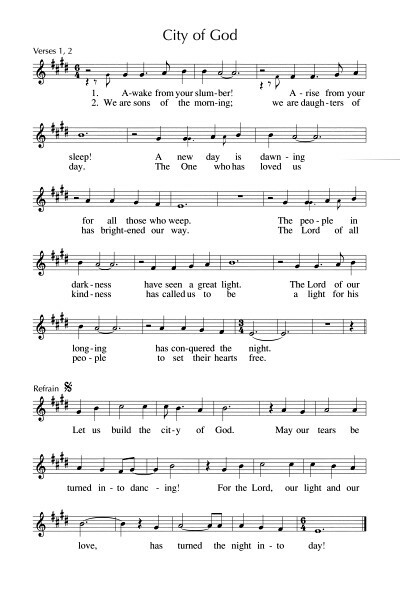 MV123 Day after day night after night (Bauman / Good) A lovely simple chant or Psalm refrain. Good for kids. TiS 547 / AHB 455 / AoV1-009 / NCH451 / CH465 / A&M595 / UMH451 / VU642 / WoV776 / ELW793 / HPP353 / GtG450 / PH339 / CP505 / CP(E) 386 / W&R502 / Cha595 / Srce70 / URW180 / 82Hml-488 / Lau970 / StF545 / MP051 Be thou my vision O Lord of my heart (8th century Irish, translated Eleanor Hull) Most recent hymnals are fairly inclusive for this. Note that the High King phrase has been changed in some hymnals because it is masculine, but the hymn is based on an ancient story of St. Patrick refusing to follow the High King Logaire, and choosing instead the "High King of Heaven". Lyrics and tune. Oldy-but-a-goody. UMH438 / VU416 / A&M476 / CP467 / CP(E) 430 / W&R718 / StF550 / Lau861 / MP159 Forth in thy name O Lord I go (Charles Wesley) Timeless words about committing all our works to God. I like this hymn best played lightly and joyfully with a simple drum beat as a kind of minstrel tune, rather than a hymn. The old fashioned words seem to make a lot more sense to me that way. Some hymnals (including TiS) have sensitively modernised the words. Older lyrics and sheet music. Oldy-but-a-goody. 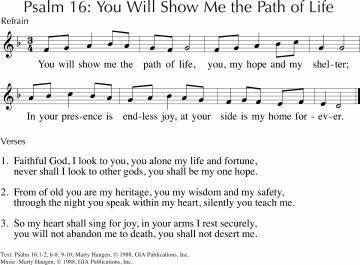 *PfAS016D My heart is glad (William Beckstrand) I really like the words and tune to this Psalm refrain. It will need to be sung through a couple of times before reading the Psalm. CH656 / VU477 / PH507 / CP060 / A&M448 / GtG515 / CP(E) 305 / W&R706 / Cha420 / SP217 / URW120 I come with joy a child of God (Brian Wren) A good and jubilant communion hymn. Lyrics & sheet music. *AoVK-12 God is our shelter truly a friend indeed (Chris O'Hara) Groovy little round / more like a call and response really. Good for kids. 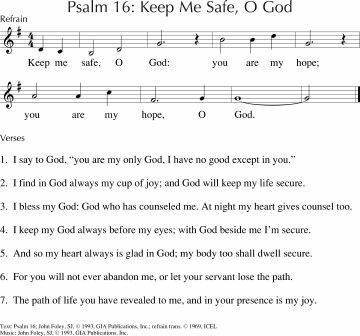 StJ / G(II)22 / GC23 / GC(II)18 / G(3)029 / Lau40b Keep Me Safe O God (John Foley) Simple cantor and response "Keep me safe O God. You are my hope, you are my hope, O God". Lyrics and sample sheet music. Sound sample. G(II)23 / GC24 / GC(II)19 / G(3)030 / URW235 You Will Show Me the Path of Life (Marty Haugen) Simple cantor and response "You will show me the path of life, you my hope and my shelter, in your presence is endless joy and your sight is my hope forever". Lyrics and sample sheet music. Sound sample. Tune In / Online Resource He left his home, fam'ly, friends / A grain of wheat (Sheree Anderson) Unless a grain of wheat falls to the ground and dies, it won't form roots and grow. A boppy song with deeply meaningful lyrics. Reference recording, lyrics and free downloadable songbook. Good for kids & teenagers. Iona (Sent by the Lord) Men and women let us walk / Sarantanani (Bolivian folk tune) “Men and women, let us move, and let’s move together” It’s fun. Traditionally, it is very fast, but it doesn't need to be. Think of those pan-pipe playing buskers in your nearest city... Great for kids. NCH297 / CH736 / VU706 / StJ / AA45 / HPSS528 / W&R518 / Cha649 / URW131 Give thanks for life the measure of our days (Shirley Murray) This song is also good for funerals and is sung to the familiar tune SINE NOMINE. "Give thanks for life, the measure of our days, mortal we pass through beauty that decays, yet sing to God our hope, our love, our praise: Alleluia, Alleluia!". Lyrics (scroll down). Tune In / Online Resource Community (Dave Brown) A great and easy to sing song about being neighbourly and living for and with others. "A glass of water shared with the thirsty, this is community". Reference recording, lyrics and free downloadable songbook. AoV2-060 / SFFS 2172 / HPP307 / GtG749 / G(II)518 / GC718 / GC(II)710 / G(3)807 Come live in the light / We Are Called (David Haas) Joyful song of mission. I love this! Lyrics, sheet music sample and slowish sound sample here. I would double the speed of this (almost). Seems to me that the reading from Mark also addresses dealing with change in our lives - and if stone walls don't last, what of our own efforts? Here's a suggestion for a song of mine about where to find hope. 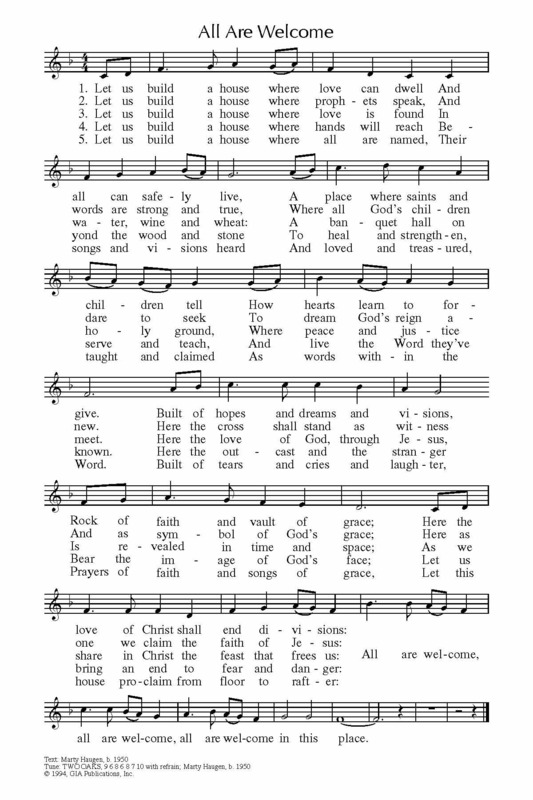 "We Do Not Know What Lies Ahead"
What are your favourite Magnificat songs?